all things bob: bacon, oh the sweet meat of the pig. smelling bacon. (not running from the cops) yum. crunchy. salty. breakfast's saving grace. a reason to wake up in the morning. a cardiologists best marketing piece. fat, sodium, fiberless. mmmmm. bob loves bacon. really. i should be kept away from farms. swine amour. long story. don't ask. imagine my surprise when i found out that other people love bacon too. iheartbacon.com best. site. ever. i've already arranged to snag that url as soon as possible (which should be soon, as bobalicious as the site is - no new posts in quite a while, damn you bacon girl). 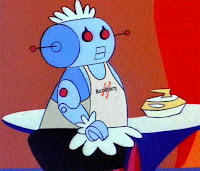 or what about robots delivering bacon in the am? is the future here now? baconrobots. their moto: because the only thing better than bacon is a hot animatronic lady to cook it for you. doood. rosie, let me lube you up. the finale. why it's the bacon of the month club. seriously. start your christmas shopping early. this is it. the grand poobah of gifts. show someone you care today. send em dead pig. bob on, my carnivorous friends, bob on. I love bacon! Unfortunately, I'm on a diet right now (to stay in shape until my cousin's wedding) and I'm sure if I smell that yummy bacon, this diet would surely go kaput..
issa ~ welcome fellow pig lover. diet be dammed. bacon is worth it. live for the salty moment. it's ok. trust me. i must say, i find the lack of bacon love appalling. don't more people realize how good it is? come on. this is 'some pig'. Reading your post wanting a bacon sandwich!